VANCOUVER, BRITISH COLUMBIA--(Marketwire - Aug. 18, 2009) - Editor's Note: There is a photo associated with this press release. Wavefront, the community-based commercialization centre for B.C. 's 1,000 wireless and new media development companies, celebrated the grand opening of its 7,000-square-foot, high-tech wireless facility in Vancouver, B.C. on Tuesday. The event featured remarks by B.C. Minister of Small Business, Technology and Economic Development Iain Black and wireless technology demonstrations by 20 B.C. companies. During the event it was announced that Wavefront has formed international partnerships with the Mobile Computing Promotion Consortium (MCPC), an organization dedicated to the promotion and expansion of mobile computing in Japan, as well as the Hong Kong Wireless Development Center (HKWDC), a flagship project to promote awareness, development and usage of wireless application technology in Hong Kong. Minister Black cited B.C. wireless technology provider WiMatek as an example of how companies are accessing Wavefront's services. WiMatek produces technology for the emerging, next-generation wireless standard known as Long Term Evolution or LTE. LTE will enable peak download rates of up 100Mbps and will provide an alternative to DSL, cable, satellite, and dial-up internet. Minister Black explained that B.C. Innovation Council CEO Dean Rockwell brought WiMatek to Wavefront to accelerate LTE's adoption and WiMatek's commercialization calling it great news for B.C. 's content and application developers who want to leverage LTE's benefits in their next-generation application designs. In his remarks to attendees, Wavefront President James Maynard explained, "Wavefront is accelerating the growth of B.C. 's 1,000 wireless and new media companies and is helping them get their products into the marketplace. Through partnerships with organizations like the MCPC and the HKWDC, Wavefront is changing the game for mobile developers and the wireless industry." Wavefront is the community-based commercialization center for B.C. 's 1,000 wireless and new media development companies generating more than $4 billion in annual revenue. 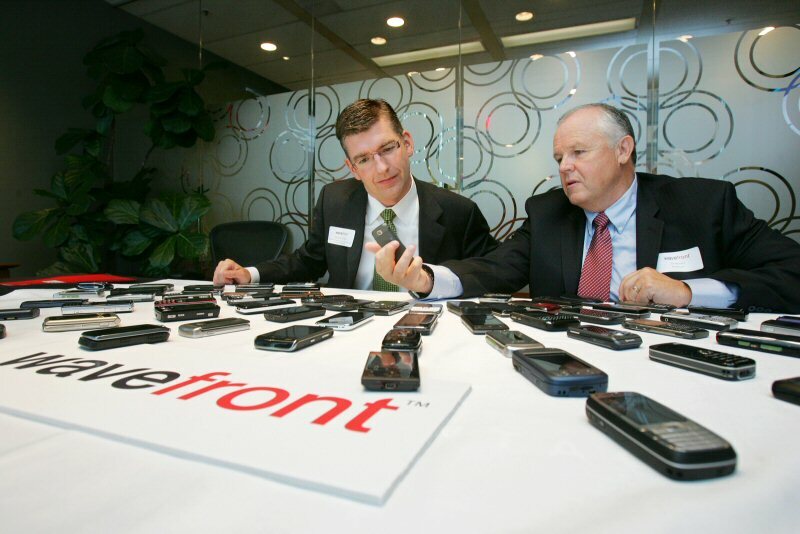 Wavefront improves speed-to-market and delivery of mobile applications and devices by providing emerging companies with a suite of WaveGuide™ training, mobile industry advisory, incubation and testing services that facilitate commercial engagement with mobile network operators and enterprise companies around the world. For more information on Wavefront, visit www.wavefrontac.com. To view the photo associated with this press release, please visit the following link: http://www.marketwire.com/library/20090818-Wavef818.jpg. B.C. Minister of Small Business, Technology and Economic Development Iain Black (left) and Wavefront President James Maynard check out some of the wireless technology available to developers through the Wavefront commercialization centre which officially opened today.